In addition to the main concerts, this year’s San Francisco Electronic Music Festival featured a concurrent gallery exhibition. It took place at Million Fishes in the Mission District of San Francisco, and featured a variety of works that combined sound and visuals. I had the opportunity to visit the gallery on the Saturday of the festival, just before that night’s concert. I have experienced Matthew Goodheart’s work with transducer-excited cymbals a few times now, most notably in his solo performance at the Outsound Music Summit. Here, he arranged them around the front room over the gallery to create an immersive installation called …silence through things secret…. The installation dominated the main room both visually and aurally, with the late-afternoon sun reflecting off the cymbals, and a variety of sounds echoing around the room. Computer-generated sounds were created from analysis of the resonances of each cymbal and recordings of each instrument played in a variety of manners. The sounds were then used to excite the cymbals via small transducers. Because the sound from the cymbals is acoustic, the only notion one has of electronics at work is the fact that they are standing on their own without anyone there to play them. But there is nonetheless something otherwordly about the visuals and sounds of the unattended cymbals. Goodheart’s piece was part of a larger project he has developed in conjunction withe Center foew New Music and Audio Technologies (CNMAT) at UC Berkeley. Giant Leap, the result of collaboration by Floor van de Velde and Elaine Buckholtz, paid tribute to the late Neil Armstrong and the 1969 Apollo 11 moon landing. The audio-and-visual work combined an anaglyph image of the moon with a sound score realized using modified rotary telephones. The moon landing and the sounds associated with that achievement are still quite fresh, but the use of rotary telephones reminds us just how long ago this achievement took place. I consider rotary phones a particularly endangered technology in that it bears so little resemblance to contemporary phones in both form and function. Dan Good presented two small kinetic sound sculptures. Artificial Lung combined standard speaker drivers in a novel way. They were pressed against one another a driven with a 1Hz sine wave. While the signal is far below the range of human hearing, the pressure on the speakers was visible and created the illusion of a breathing organism. SFEMF has featured installations before, usually as fixtures in the lobby during concerts. I thought separating it out into a gallery presentation worked well and allowed the pieces the chance to be seen outside the shadow of the live performances and milling crowds. I hope they do this again next year. 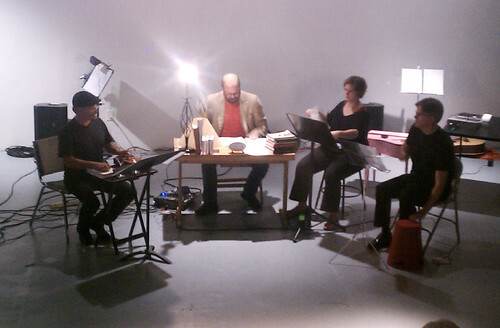 The Outsound Music Summit continued with The Composers Muse, a night of new compositions by three noted Bay Area composers. They were participants in the Composers’ Forum that I moderated earlier in the week, where they gave tantalizing descriptions of their work. On this evening, we finally got to hear what they were talking about. The concert opened with the Skadi Quartet performing compositions by Christina Stanley, who also is the first violist for the quartet. Her compositions were based on large abstract oil paintings that were placed center stage, with members of ensemble arrayed to either side. As someone interested in visual art as well as music, I was quite intrigued by this piece, and how the composer wanted the performers to interpret the visual work. Stanley had very specific instructions for performers in each piece for how to perform the score. In the first piece, Put it On, performers were to move visually from the focal point just to the lower right of center and move outwards, with different shapes corresponding to very specific sounds and modes of playing. You can see a close-up of the score at Stanley’s website. Within this structure, the music began with short notes and then moved to longer bow strokes, jaggedly moving up and down in pitch. My visual and aural senses focused on the straight-line character of both the score and the music. At one point, the performers diverged into different textures, with staccato notes against longer lines and glissandi that then melted into a single harmony. There were also elements of noise and percussive scraping, harmonics, and quite a bit of empty space in the sound. The piece concluded with a large and more traditional flourish. The second piece was a duo of Stanley and cellist Crystal Pascucci. The score for this piece was more sparse with curving lines, and these qualities were reflected in the music as well. It started with harmonics and other high, airy tones. Overall, it was more melodic, but with some pizzicato tones as well. Gradually, the cello became lower and filled out the harmony, which seemed almost folk-music-like at times. There other elements such as sliding harmonics, but overall it still fit with the visual imagery of the score. The next set featured a solo piece written and performed by Matthew Goodheart for piano and metal percussion. Gongs and cymbals were placed at various spots around the hall, including in the balcony. A small transducer was attached to each of the instruments so that it could be excited by electronically generated sounds. The sounds used to excite the metal percussion were created by analyzing the partials and spectra of such instruments, a process that was part of his research involving “recursive physical object electro-acoustics” at the Center for New Music and Audio Technologies (CNMAT). The acoustic and spectral properties of these sounds also informed Goodheart’s live piano performance during the piece. The music that resulted was unusual and exceptionally beautiful. It began with high ethereal harmonics coming from the cymbals and gong spreading across the hall, and then high notes from the piano to match. The piano and some of the harmonics featured in the metal percussion gave the music an air of anxiety even while it was calming. As the harmonics grew thicker, the timbre grew more metallic and at moments took on the quality of water pouring. The music became more active, deeper harmonics and a few tones that sounded like flutes and clarinets alongside the metallic resonances. Again, Goodheat’s piano matched the changes in timbre as he moved into lower registers. Some of the sounds from the cymbals became more disjointed, sounding like tops, and after a loud gong hit the texture of the music grew thicker and more inharmonic. Then all at once it stopped leaving a single resonance. It looked like Goodheart was playing inside the piano as well with various objects, though it was hard to tell from where I was sitting. There were various percussive sounds and something that reminded me of my cat scratching, and then piano became more harmonic and tonal again with rather plaintive chords. There were more high frequencies and electronic swells broadcast through the cymbals, and a finale with a single repeated note on the piano. Overall, the performance was one of the most memorable experiences of the summit. The movements were bounded by vocal interpretations of cryptograms from the New York times. The encrypted text was sung by Polly Moller, who had to work through challenging clusters of consonants. The decrypted solutions, which often featured corny or trite phrases, were sung by Hadley McCarroll in a more melodic style. Within this structure, each movement began with a solo by one of the nine performers, with a couple of other instruments gradually joining in, and finally the entire ensemble. Each of the solo sections had a very different character, representing both the performer and his or her instrument. Ava Mendoza’s strong articulation on acoustic guitar stood out, and Polly Moller’s solo on bass flute sounded quite familiar from Reconnaissance Fly pieces. The piano solo by Hadley McCarroll was quite aggressive, as was the bass clarinet solo by Matt Ingalls. There were interesting moments in the ensemble playing as well, such as a big minor chord and a section that more jazz or cabaret-like. Other sections were extremely quiet. The final movement featured a percussion solo by Gino Robair on a variety of instruments and implements, which mirrored the introduction to the piece. Other members of the ensemble included Philip Greenlief on clarinet, Monica Scott on cello, Scott Walton on bass, and Sarah Wilner on violin. This was a very successful concert for the Outsound Music Summit, and not only musically. We had a full house at the Community Music Center, and I am pretty sure we set a record for paid attendance. There was certainly a lot of Outsound, curator Polly Moller, the composers and performers to be proud of.